Originally released in 1988, this game used the good, old Video Cassette Recorder to play along with your favorite stars, and had Andre the Giant & Hulk Hogan prominently featured on the cover. 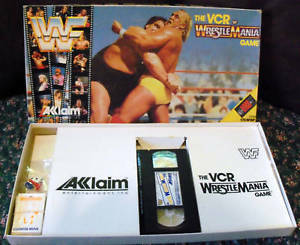 The Wrestlemania Game was part of the VCR Game series by Acclaim, which also included Hockey, Basketball, Golf, and Quarterbacks. The video included consisted over one hundred clips of matches, each clip lasting around a minute in length. Players would advance on spaces and draw cards that either push you forward or back on the board – based on various wrestling moves. With one trip around the board, you win one fall. 2 out of 3 falls wins the game. Players could also lose a match by going all the way backwards, which the games version of being ‘counted out’.